NEW YORK (CNS) — As the real Boys Town celebrates its centennial, its big-screen counterpart — captured in the eponymous 1938 film and its 1941 successor, “Men of Boys Town” — invites fresh consideration. The original movie garnered Academy Awards for Spencer Tracy and screenwriters Dore Schary and Eleanore Griffin. But how do these two products of Hollywood’s Golden Age hold up today? Perhaps the first thing to note is that, whether despite their age or precisely because of it, they contain material capable of startling contemporary viewers. That includes the 1938 feature’s surprisingly downbeat opening scene, set on a grim prison’s death row, as well as a sight gag involving Mickey Rooney in blackface that, though momentary, blazes with cavalier insensitivity. Thus, like all movies of their vintage, the Boys Town films require historical interpretation. These days, after all, it’s likely that more people have seen brief clips than have viewed both pictures in their entirety — though the first used to appear on TV screens at Christmastime. MGM paid Boys Town founder Father (technically, from 1937 onward, Msgr.) Edward J. Flanagan $5,000 for the movie rights to his life story. Additionally, the films, once released, gave an already famous institution instant and immensely valuable name recognition. Father Flanagan and others used a documentary, some of it filmed during MGM’s location shooting in Omaha, Nebraska, for fundraising appearances. The most accurate parts of the first, far stronger, movie — both were directed by Norman Taurog — show Irish-born Father Flanagan (Tracy, of course), who was operating a home for indigent alcoholic men, getting his idea for Boys Town, then working to implement it. As depicted on screen, the orphanage took its genesis from a pastoral visit to a condemned prisoner, convicted murderer Dan Farrow (Leslie Fenton). Not exactly subtle screenwriting. But the placement of the sequence is at least original; in the gangster films of that era, the death-row scene always came last — think of James Cagney’s unforgettable final moments in “Angels With Dirty Faces,” also from 1938. A story cannot be more unambiguous than defining a priest’s mission as rescuing boys from a life’s path that ends in execution while also criticizing the harsh conditions found in reform schools of the day. The most adroit portrayal in “Boys Town” involves Flanagan’s friend and initial funder, Dave Morris (Henry Hull). Flanagan badgers Morris out of cash and second-hand furniture to equip his first home for boys, and later for the purchase price of the farm that becomes the institution’s new campus. According to “Father Flanagan of Boys Town: A Man of Vision,” a biography by Hugh Reilly and Kevin Warneke, it was no secret that Omaha attorney Henry Monsky, who served on the Boys Town board of directors and was later the national president of B’nai B’rith, gave Flanagan the initial $90 for the house — and raised funds from then on. But Monsky never sought public credit for this. 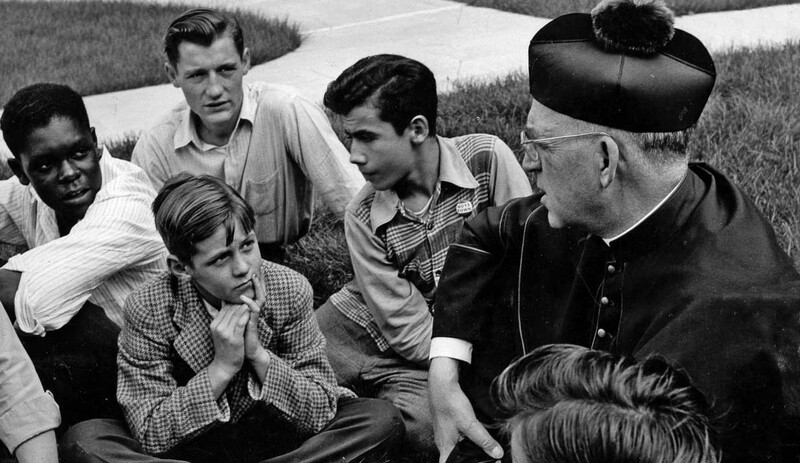 How, then, to show the interfaith background of Boys Town? Schary and Griffin’s solution was to make Morris a pawnbroker. That he’s Jewish is never mentioned, but audiences in 1938 would instantly have recognized the stereotype, even written as delicately as it is. Religious plurality at Boys Town is first mentioned when Rooney, as the incorrigible Whitey Marsh, is in the dining hall and another boy tells him that there are no prayers at the meal, since at Boys Town all faiths are welcome and they can pray as they like. Then again, later in the picture when Pee Wee (Bobs Watson) is struck by a car and there’s an outdoor vigil, all the boys are shown kneeling in prayer as “Ave Maria” plays on the soundtrack. It’s the only specifically Catholic moment. Taurog gave free rein to Rooney’s frantic mugging and clowning. (It may help to know that, years later, Taurog was a favorite director of Jerry Lewis). Most of this now looks odd, but Rooney, who debuted as Andy Hardy the year before in what became MGM’s Hardy Family series, was a rising star at the time, and he dominates the entire second half of the movie. This sets off an extended sequence in which Whitey gets a series of comeuppances from the other boys. When he demands that the campus barber, Mo Kahn (Sidney Miller), give him a facial massage — something to which he’s accustomed in the city — Mo accomplishes this with shoe polish on his hands. So when Whitey dashes off to a roll call, he looks like Al Jolson in blackface. Some comedic ideas from 1938 endure. Others, like this one, are museum pieces. “Men of Boys Town” reprised the principal cast, but the emotional heavy lifting went to child actor Darryl Hickman, who liked to stick out his chin like Shirley Temple. The script by James Kevin McGuinness included the stale trope of having a boy’s dog die, Rooney was subdued, and the picture, lacking the original’s emotional wallop, didn’t duplicate the earlier film’s success. Movies as powerful as “Boys Town” sometimes have real-life Hollywood endings years later. In 1991, Watson returned to Boys Town for the dedication of its new $5.5 million chapel.